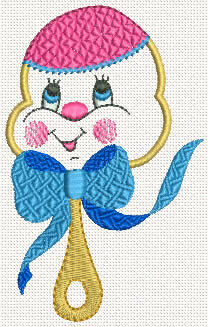 A cute baby rattle embroidery design. The design is available in 2 sizes. The smaller size design will fit in a 4 x 4 hoop. This design is also available in a set with 3 other baby embroideries. The set is offered with a 20% discount from the price of separate designs.